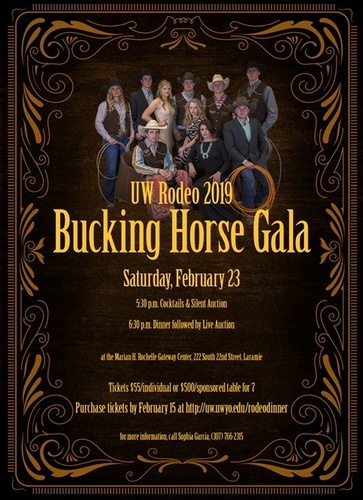 The UW Rodeo Team would like to extend an invitation for you to attend the first annual JCA Companies - UW Bucking Horse Gala on February 23. We hope this is a great night for everyone to get together and have fun supporting the rodeo student athletes, agriculture and rodeo. The night will consist of meeting the rodeo team and coaches, a beef dinner, guest speaker Jason Miller – Former UW rodeo alumni and 2007 world champion steer wrestler, and fundraising through live auction and silent auction items. The students are working hard to help put this event together and we are excited to see all the auction items they are bringing to support their rodeo program. The link to purchase tickets is very simple to use. Just click http://uw.uwyo.edu/rodeodinner and it will walk you through a couple easy steps.